Recently Kevin Burkhart and I climbed the Kaweah Traverse in Sequoia National Park. Ours was the third or maybe fourth ascent of the traverse and the first time (that I know of) that it's been guided. Yours truly on the approach with most of the traverse in the background. Photo by Kevin Burkhart. 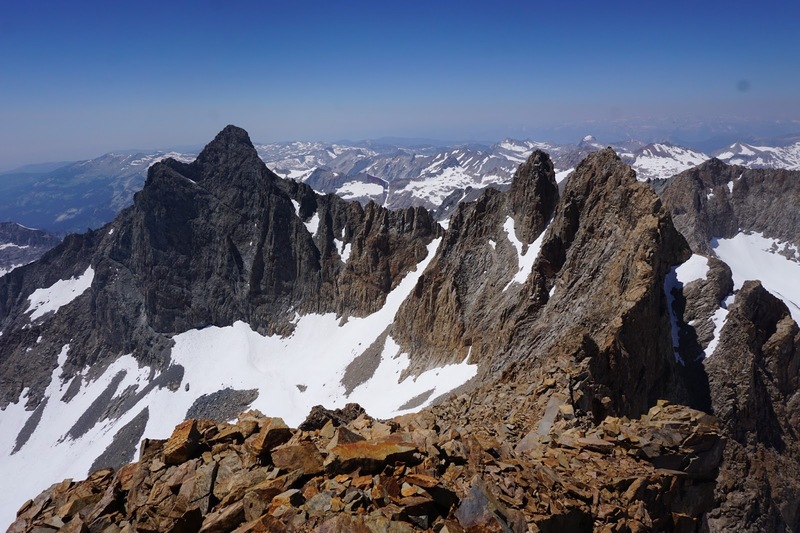 In a big mountain range full of fantastic alpine ridges, the Kaweahs are a bit of an anomaly. This group of 13,000 foot peaks are not, for the most part, made up of the granite for which the range is famous. Instead they are of a rock that is significantly lower in quality. The original Kaweah Traverse was accomplished by Andy Selters, Claude Fiddler, and Danny Whitmore in July of 1997. This trio traversed about two miles of ridge line, from Black Kaweah to Second Kaweah, taking on 6 other named 13'ers and a bunch of unnamed bumps and towers in between. 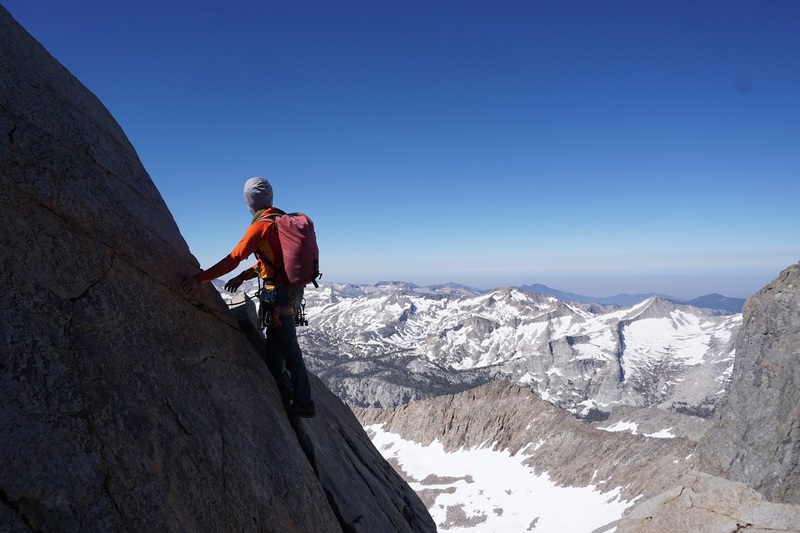 Climbing California's High Sierra rates the traverse IV 5.9. There is minimal information available about the route. I think Kevin first mentioned the Kaweahs to me when he, his wife Heather, and I did the Palisade Traverse (Thunderbolt to Sill) several years ago. As someone who is fond of Sierra ridges it was on my radar, and the fact that he brought it up piqued my interest. Here was somebody as interested in this obscure route as I was! A year passed and Kevin returned to the Eastern Sierra last summer to climb the Sun Ribbon Arete on Temple Crag. Again the Kaweahs were spoken of. Then we had one of snowiest winters ever. I knew that we would need to bivy on the ridge to succeed, and that meant we would need snow to melt for water. As soon as it became clear to me that there would be no lack of snow, I reached out to Kevin and the planning began. Kevin somewhere on the East Ridge of Black Kaweah. I was up front with Kevin right from the start that not only had I not done the traverse, I had never even been in that part of the range before. Some climbers want their guide to be intimately familiar with the route and peak(s), but Kevin was fine with the fact that it would be an onsight for me. On a route of this nature that could mean backtracking or doing more or harder climbing. We had, I think, built some trust on our previous two trips, and I think he was looking forward to something with a few more unknowns than usual. Without the unknown, after all, there is no adventure. A climb of this nature also required that I put some serious trust in Kevin. 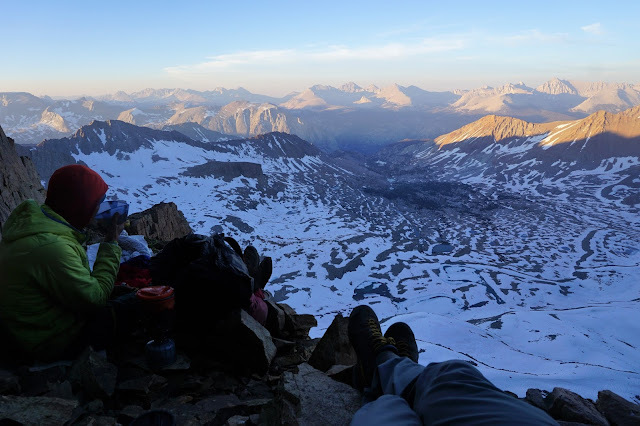 Though I brought guide skills, climbing experience (and alpine ridge experience in particular) to the table, this climb would need to be a real partnership to manage the risks posed by loose rock and unknown terrain. Kevin is an experienced trad climber, and has done a ton of 4th and low-5th class around the country. This somewhat rare pairing of skills was combined with some serious interest in this route. 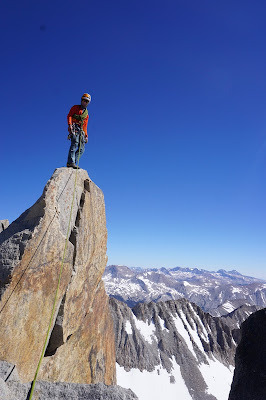 Kevin's research meant that not only did he get local beta for an approach that cut our hiking distance almost in half, but he also went in with eyes wide open about the loose rock, something that I think is necessary for success on the Kaweah Traverse. Though there were a number of surprises along the way, low quality rock was never one of them. Looking north from Red Kaweah with Black Kaweah, Pyramidal Pinnacle, and Koontz Pinnacle in view. There is minimal information available about the route. In the interest of adding to that I include slightly more beta than I might normally, but please understand that in endeavors like this a sense of urgency is necessary and quality note taking often fell by the wayside. We left Mineral King a little after 9am. 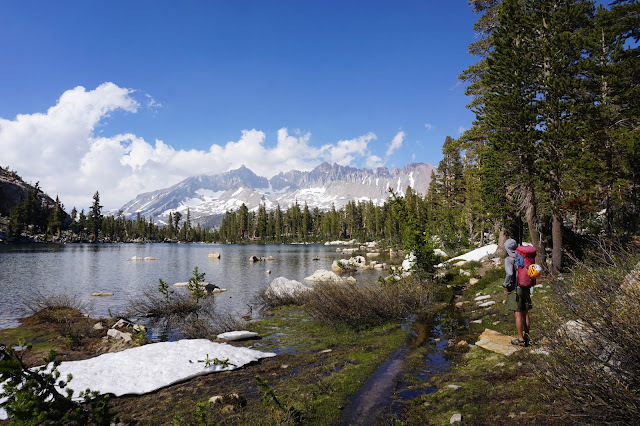 Kevin's route to the Big Arroyo, our basecamp, wound over Glacier and Hands and Knees Passes and through the Little Five Lakes Basin following trails, abandoned trails, and our noses. Towards the end of the day we shed our shoes for several creek crossings, some of them more than knee deep, fast, and cold. Near the old Big Arroyo ranger cabin we ran into a backcountry ranger who warned us that the Kaweahs had a lot of loose rock and that it could be snowy up there. We spent the night comfortably under my tarp. The next morning there was no alarm. I thought we'd be working hard each day on the route and wanted to leave our basecamp well rested from the hike in. After a leisurely breakfast we started hiking northeast uphill through open woods and granite slabs. eventually we reached the treeline. That ranger was right, there was a lot of snow, and we were happy for it. The last mile or so of our approach to Black Kaweah would have been endless talus was it not covered in supportive snow. We took the Southwest Face route to the summit. It was fairly straightforward and soon we were on top snacking and snapping photos of the peaks laid out ahead of us. From the summit we descended directly east on technical terrain and got onto the east ridge via a convenient ledge. Looking back later that day, we saw that we could have accessed that ledge much more easily by backtracking a bit. The east ridge was exposed, loose, 4th to low 5th class...and surprisingly fun. Our only snafu came on the one rappel we made but that was quickly fixed and soon we were hiking up the northwest slopes of Pyramidal Pinnacle looking for a place to spend the night. There were a number of snow patches and many semi-flat sites, but for some reason I wanted to keep hiking. Before too long I saw it, a cave! With a shout I ran over to it, expecting the floor to be filled with sharp rocks or guano or both. Instead it was almost-completely-level sand and small gravel, a comfortable size for two grown men. A few moments of work from Kevin, the high-end custom carpenter, and it was perfect. Just a few steps away was a snowfield melting into liquid in the late afternoon sun. Excellent views back up the east ridge of Black Kaweah were the icing on the cake that is my new favorite bivy spot. Soaking up the view from my new favorite bivy spot. The following day we left the magnificent cave a little after 7am. We scrambled up to the summit of Pyramidal Pinnacle with ease, and soon found ourselves downclimbing exposed 4th and low 5th class. We could have gone back down the way we came and wrapped around to the other side of the Pinnacle on easier terrain, but we wanted to keep our traverse as true as we could, riding the skyline. A short rappel completed our descent to the notch with Koontz Pinnacle. Some unnecessary but fun 5th class climbing brought us to the top of Koontz Pinnacle, which has a classic Sierra summit block. In his guidebook Peaks, Passes, and Trails RJ Secor mentions that Koontz Pinnacle is not shown on the USGS Triple Divide Peak 7.5 minute map. It seemed to us, after sitting up there with the gps on my phone, that in fact its Pyramidal Pinnacle that's not shown on the quad. Me on top of Koontz Pinnacle. Photo by Kevin Burkhart. Traveling along the ridge from Koontz was fun but became involved, eventually necessitating a 40m rappel. This was followed by a hike up Red Kaweah, one of the easier peaks on the traverse. There was some kind of butterfly migration happening and hundreds of orange and black butterflies led us along the ridge and up to the summit. Getting off the other side was more complicated, we made one rappel that I can recall. Climbing up the north side of Michael's Pinnacle was forgettable, but the summit register was not. 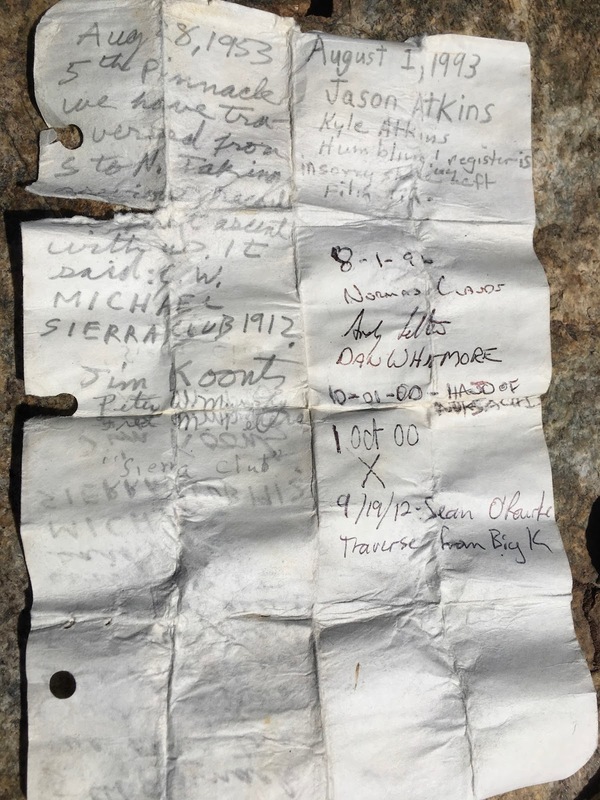 Placed by Jim Koontz himself in 1953, it had a transcription from Charles Michael's original register and had been signed by a who's who of Kaweah climbers, including the only other parties we knew of who did the traverse. It's a piece of Sierra history. I'm not normally particularly excited to sign summit registers, but I was honored to sign this one. That is, until we discovered the pen didn't work. Kicking ourselves for not bringing a pen, we continued south in the dwindling daylight, eventually dropping off the crest a bit to a bivy overlooking Kaweah Basin. The Michael's Pinnacle summit register. It could use a new pen and container. Looking east towards Williamson and Whitney from our second bivy. Photo by Kevin Burkhart. In the morning the towers seemed to go on and on and included two 20m rappels, but eventually we found ourselves in front of Squaretop. We traversed onto the west side over at least one rib to get to the Northwest Face route which brought us quickly to the summit. A time consuming gully took us down to the col before Bilko Pinnacle. Here fun 4th class on a rib over to the west side of the col brought us to the summit and our first good views of Grey (aka Second, aka False) Kaweah. Kevin sailing the seas of choss somewhere on the ridge. Tales of a spat between the first ascensionists and 5.9 climbing had us wondering if one of the towers before us would contain the crux. Instead we found (on I believe the second tower) enjoyable 5.7 climbing on some of the best rock on the ridge. Before long we were fist bumping on top. I know I felt like we were getting away with something. We still had a lot of daylight left, and both of us felt like it would make a lot of sense to include Mount Kaweah, the tallest of the Kaweah peaks. It was only a matter of some class 2 hiking, so we signed that summit register too. Our big winter had left snow still parked on the west face of the peak, and a 1500 foot standing glissade sped our descent and put smiles on our faces. While Kevin and I both enjoyed this traverse neither of us feel a need to do it again. Climbers who are dying to send this one would be well-advised to do some of the other big (and higher quality) traverses first. Though this one isn't as long as the full Palisade or Evolution Traverses, the decision making and risk management is probably harder. Couple this with the low level but continuous loose rock and the Kaweah Traverse is likely as difficult as those longer ones. As Kevin put it, “this one is for the Sierra ridge 'choss-isseur'”. Somewhere in the Kaweahs. Photo by Kevin Burkhart. Nice work. I'm surprised that the south side of Pyramidal Pinnacle went at 4th or low 5th. It looks pretty vertical from Koontz. Thanks! We were both impressed with your lap up there! It was mostly ledgy 5th class. The last 15-20M are significantly steeper, and we rapped this (as I mentioned).